Sixty-eight kilometers southeast of Yibin City, you find an extraordinary natural bamboo forest, covering a total area of 60,000 mu (4,000 hectares), including 500 hills. The Bamboo Forest scenic area, situated at an elevation ranging from 600 m to 1,000 m, features as many as 58 different bamboo types. Strong and dense, from a distance they seem to resemble a green ocean. The scenic area also features mountains, rivers, karst caves, lakes and falls. In the middle of the forest you find many cultural relics and historical sites, such as the Bamboo Forest Museum, the old folk residences on Mount Xijia and fish fossils. The scenic area has very enjoyable weather with a year-round average temperature of 15.5℃ (60℉). It is the perfect place to enjoy some fresh air and gaze out over the beautiful landscape. 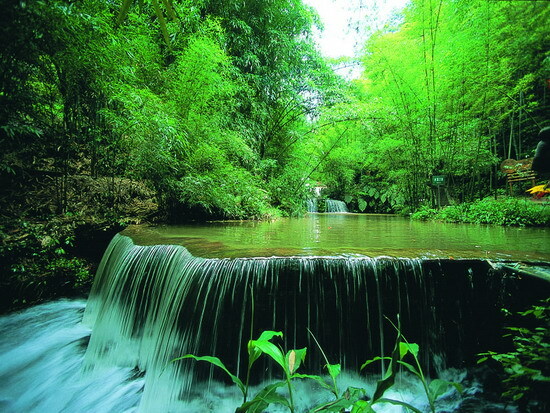 It has been described as "one of the top 10 most beautiful forests in China."